The Northland Pines boys basketball team topped Rhinelander last week. Ryan Peterson collected two of his game-high 24 points as teammate Joe Misina looked on. For the first time since the formation of the Great Northern Conference (GNC) a decade ago, the Northland Pines boys basketball team beat Rhinelander 68-54 last Friday at the Pines field house. Pieper said the Eagles played a complete game, and it showed on both ends of the court. 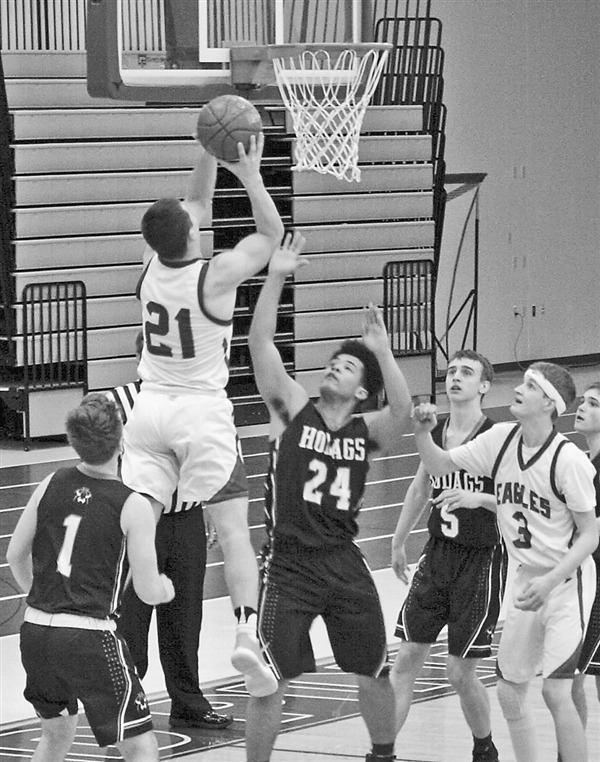 The Eagles defense was stellar in the first half, allowing the Hodags just 22 points. Meanwhile, the Eagles offense was efficient, building a 36-22 halftime lead. Offensively, Pines was led by Ryan Peterson with 24, Joe Misina with 15, Ben Tilley with 11 and Jack Hayes with seven. “We had a lot of guys play really well on offense for us,” said Pieper. “It was a really balanced attack on offense. “Ryan (Peterson) had a really nice night finishing with a game-high 24 points, scoring 12 in each half,” said Pieper. “They were trying to double him and run extra guys at him but he was patient and really had a great game. “A lot like Joe, Ben Tilley played really well on both ends also,” said Pieper. “He was really aggressive in the first half attacking the basket and had a big eight first-half points for us and finished with 11 on the night. The Eagles have been playing well since the end of December. Pines is 3-5 in the GNC and 8-8 overall. Rhinelander dropped to 4-4 in conference play and 7-8 overall. Mosinee still leads the GNC at 8-0, followed by Lakeland at 5-3 and Antigo at 4-3. Medford is 3-4 and Tomahawk is 0-8. “It’s been a special year for our program so far, but we are far from done. We’ve had a lot of ‘firsts,’ which is awesome, but we plan on adding to the list of ‘firsts’ before it’s all said and done,” said Pieper. The Eagles were scheduled to play Lakeland last Tuesday, but that game was postponed due to poor weather. The game has been rescheduled for this Saturday, Feb. 9, at 7:30 p.m.
Pines will also host Crandon in a nonconference game this Thursday, Feb. 7, at 7:15 p.m. A nonconference game against Phillips on Tuesday of this week was postponed and will likely not be played because the Loggers need to get in their conference games.